There are six DRF teams in the EVDM wing and the idea is to have a set of the advanced equipment for each team and keep four sets as reserve in the GHMC head office. 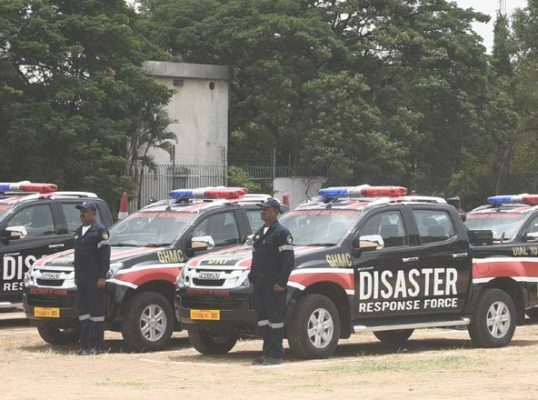 Hyderabad: With the Disaster Response Force (DRF) personnel taking up different rescue operations, especially firefighting exercises, the Enforcement Vigilance Disaster Management is planning to procure more advanced fire safety equipment for the personnel. 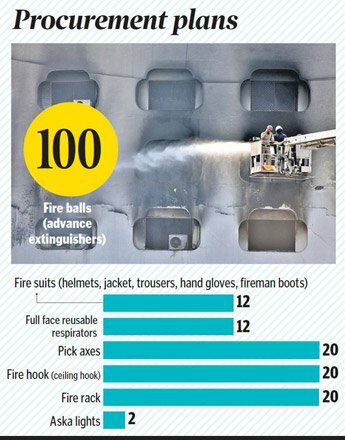 The new equipment to be added includes fire suits, full face reusable respirator, fire extinguisher balls, helmets, pick axes, fire hooks, fire racks and Aska lights. The equipment helps in ensuring safety of DRF personnel, besides aiding them in taking up firefighting exercises more effectively. Though the DRF personnel along with Fire Services Department take up rescue operations and firefighting exercise during fire accidents in the city, they are not professional firefighters. This was evident, when a team member was rushed to hospital due to asphyxia while dousing flames at Khan Lateef Khan Estate, Basheerbagh in January early this year. The DRF personnel are trained in firefighting exercises and work as supporting staff but they lack the required fire safety equipment. “Considering all these factors, we have decided to purchase advanced fire safety equipment for them. They toil hard in different conditions and it is our responsibility to ensure their safety,” said GHMC EVDM Director Viswajeet Kampati. After Mumbai, Hyderabad is the only city to be equipped with an exclusive Disaster Response Force set up for effectively handling different works during calamities. There are six DRF teams in the EVDM wing and the idea is to have a set of the advanced equipment for each team and keep four sets as reserve in the GHMC head office. These personnel are stationed at strategic locations across the city. Using the equipment, the nearest stationed DRF personnel can reach the fire accident immediately to commence the rescue operations. Under the pilot project, different equipment is being procured and if there is demand for more such equipment, they can be procured in phases, he said. The Greater Hyderabad Municipal Corporation (GHMC) is taking steps to strengthen the DRF strength by adding additional personnel. smooth flow of water in manholes during rains to rushing to the aid of those caught in fire mishaps, the DRF personnel take up different works. They have been trained to conduct first aid as well. Every individual carries one first aid pouch, besides a full-fledged first aid box in the vehicle. As a means to diversify their services and set up its wings in different zones of the city, GHMC is adding additional staff.